If you’ve been following superhero movie news at all this week, you’ll have seen that Man of Steel, Batman V Superman: Dawn of Justice and Justice League (well, bits of it) director Zack Snyder has been spilling his guts on Vero about the imagery and canon of the films as he conceived them. We’ve seen stories about the repeated use of horses, Lex Luthor killing his father and explanations of the ‘Knightmare’ sequence. 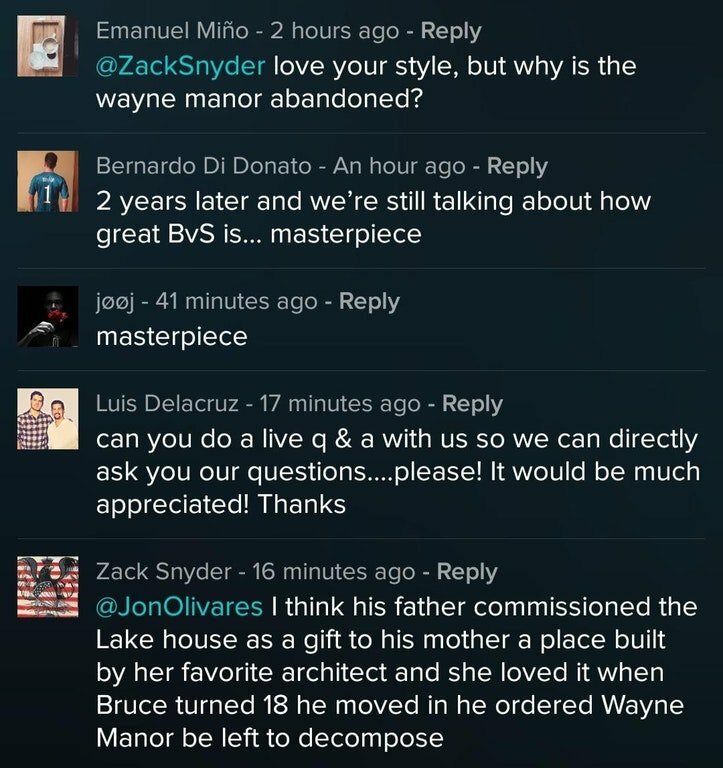 The latest of these revelations concerns not-so-stately Wayne Manor, specifically why it was a partially destroyed ruin in Batman V Superman. While the jury’s out on whether the fact that Zack Snyder has had to go online and repeatedly explain what the film was trying to say is indicative of it being great cinema, this particular explanation rubs me up the wrong way. I’m not going to be one of those moronic ‘not my Batman’ types, but it simply doesn’t make sense to me that Bruce Wayne would specifically order Wayne Manor to be left to go to ruin. For one, it seems like something Alfred just wouldn’t tolerate and for another, it’s a foundational core of Batman that he respects the memory of his dead parents. To be fair, Bruce Wayne did sort of allow it to burn down in Christopher Nolan’s Batman Begins – but it was eventually rebuilt by the time of The Dark Knight Rises. Besides, there’s just something kind of ‘off’ about Batman spending his entire superhero career living in a lake house. Most fans (me included) had assumed Wayne Manor was in this state due to a villain discovering his identity and hitting Batman where it hurts – possibly the same sequence of events that resulted in the ominously defaced Robin uniform preserved in a Batcave display case. It remains to be seen whether Matt Reeves’ DCEU Batman movie will adhere to Zack Snyder’s plans or go its own way, though I think it’s touch and go whether that project will ever see cinema screens at all. Regardless, it’s still nice to get a couple of loose ends from Batman V Superman: Dawn of Justice cleared up, even if I think they’re kind of dumb.